A lot of people with avoidant personality disorder (avoidant PD, AvPD or APD) live with this disorder for a long time without being aware of it. Even when people with avoidant PD eventually visit a psychiatrist or psychologist the avoidant personality disorder diagnosis is often missed by the professional. The avoidant PD symptoms are very similar to (severe) social phobia, causing the latter to be made earlier than AvPD. Being able to trust the therapist is a vital ingredient for avoidant PD treatment, because people with APD in general have trust issues already. And trust issues cause them to withdraw and lead a more isolated life. A proper avoidant personality disorder diagnosis is important, because it makes it easier for people with AvPD to understand their mental disorder, to get the right treatment, and to work towards a recovery. Recovery often involves posttraumatic stress disorder (PTSD) treatment for the traumatic experience in the past, as well as cognitive behavioural therapy (CBT) techniques such as behavioural experiments to learn to trust people and to reduce others avoidant PD symptoms. Here is a list of the avoidant personality disorder symptoms as listed by the DSM V.
Take the avoidant PD test. (A1) The person avoids occupational activities that involve significant interpersonal contact, because of fears of criticism, disapproval, or rejection. Examples of such situations are: social activities with coworkers outside of work; giving presentations; having lunch together. Avoiding harm is more important for these people than pursuing desires. (A2) The person is unwilling to get involved with people unless he or she is certain of being liked. People with avoidant PD are so preoccupied with (possible) rejection that they rather not meet with someone if they are not certain of being liked. And if they meet with others they pay a lot of attention to the other person’s (nonverbal) behaviour to see if these people reject them. (A3) The person shows restraint within intimate relationships because of his or her fear of being shamed or ridiculed. Someone with APD may be very insecure about their physical appearance (despite working out a lot) or about their performance in bed. Because of their sensitivity to rejection or being shamed or ridiculed, they pay a lot of attention to signs of potential rejection of their partner. 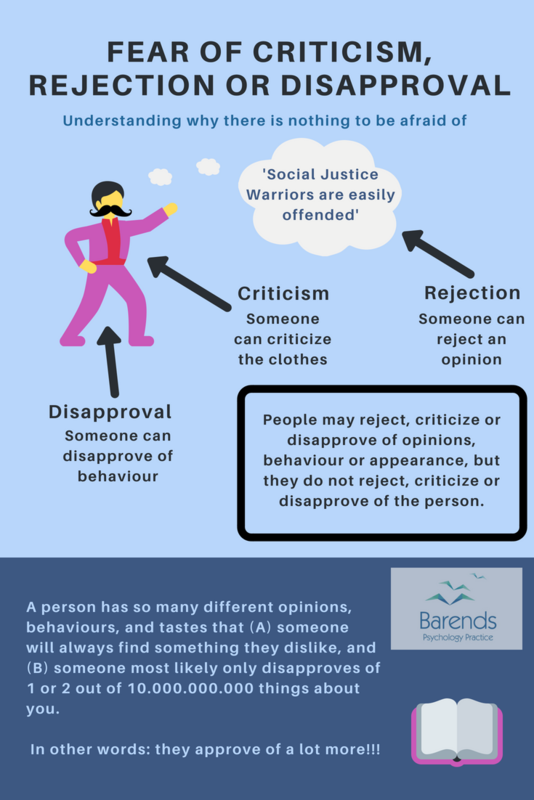 (A4) The person is preoccupied with being criticized or rejected in social situations. This can cause someone with avoidant PD to be more withdrawn in social situations. It could happen that someone with APD ends up doing something (like watching a movie) they dislike, because they don’t dare to give their honest opinion (out of fear of being criticized or rejected). (A5) The person is inhibited in new interpersonal situations because of his or her feelings of inadequacy. Someone with avoidant PD may have the feeling they are not interesting enough or can’t keep a conversation going. This may result in a self fulfilling prophecy. (A6) The person views himself/herself as socially inept, personally unappealing, or inferior to others. It could happen that someone with APD is preoccupied with the way he or she comes across. Being to much aware of their own behaviour, they can easily start feeling more socially inept, inferior to others and unappealing. (A7) The person is unusually reluctant to take personal risks or to engage in any new activities because they may prove embarrassing. An example of personal risk is participating in a game or match. (B) This enduring pattern of inner experience and behavior must deviate markedly from the expectations of the individual’s culture. Remember that someone’s behaviour must be judged against his or her own cultural background. If someone comes from a cultural background where being introvert is normal, then it’s likely that this person is more introverted by nature, compared to people from a different cultural background. (C) This enduring pattern is inflexible and pervasive across a broad range of personal and social situations. If someone is afraid of rejection, shame and ridicule at work, but not at home or among friends, then it’s likely more situational rather than personality. (D) This enduring pattern leads to clinically significant distress or impairment in social, occupational, or other important areas of functioning. If someone doesn’t experience any clinically significant distress or impairment in someone’s functioning in any way, then there is no reason for this person to change at all. NOTE: Avoidant personality disorder must be present for more than 1 year. There is an overlap between avoidant personality disorder traits and schizoid personality disorder traits. Make sure your therapist takes this personality disorder into consideration as well. If you have questions regarding the avoidant personality disorder diagnosis, please contact us.